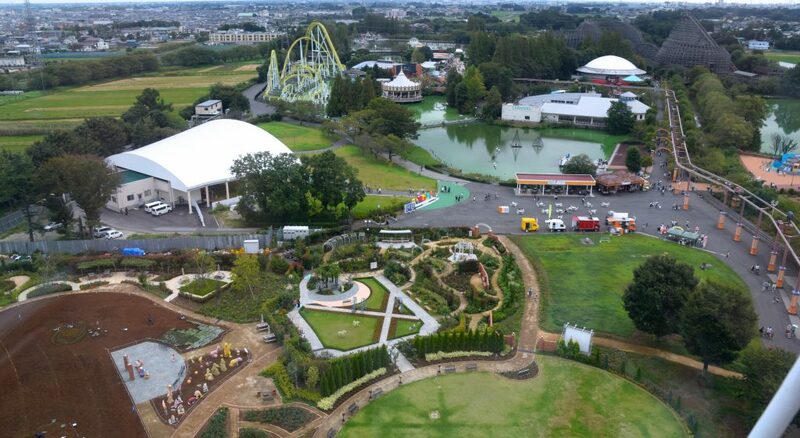 Alexander: I wish I could say that the first official park of the East Meets Ace tour was a great park, but Tobu Zoo is not a great park. While the park has an enjoyable lineup of attractions, and management was kind enough to welcome us with ERT, the “zoo” part of the park is enough to prevent us from coming back any time soon. 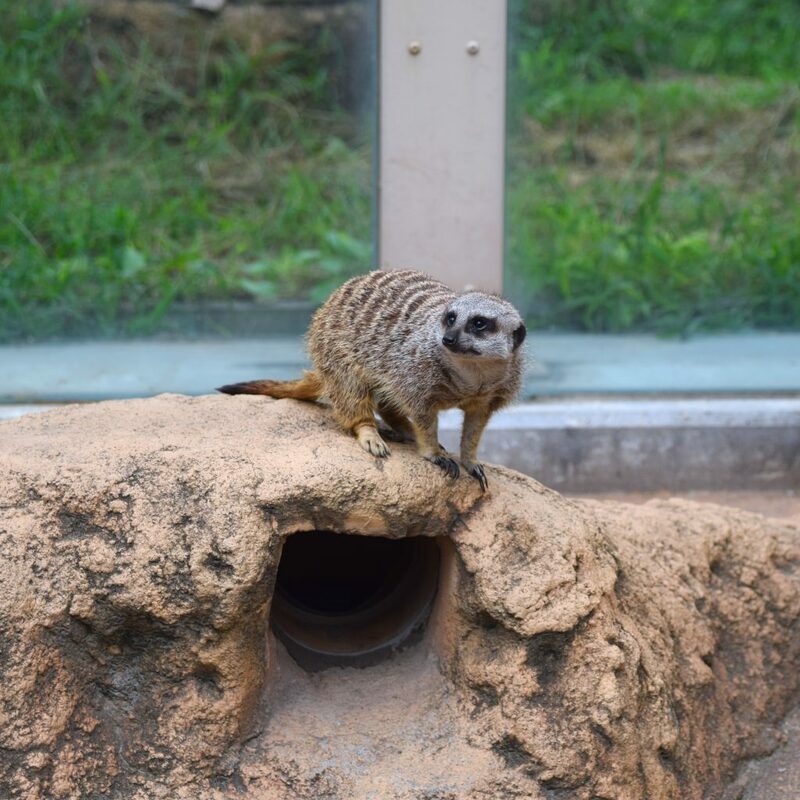 We entered on the “zoo” side of Tobu Zoo and were treated to a quick survey of sad-looking animals. More on that later. 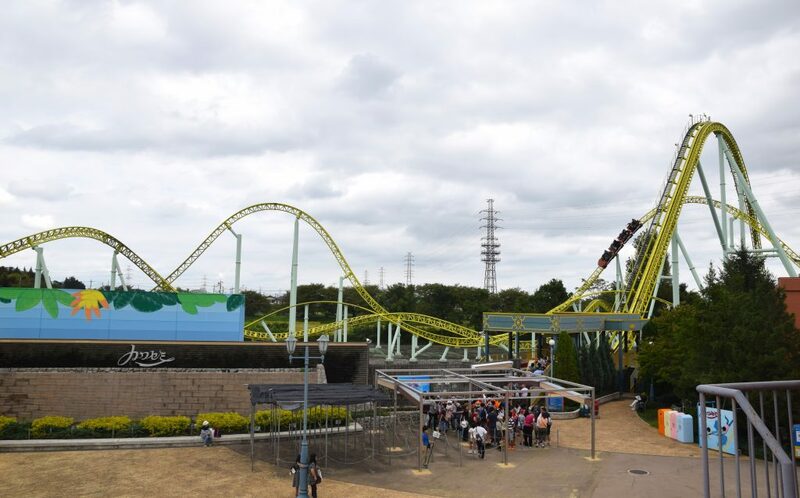 The main event at Tobu Zoo is probably Kawasemi / Kingfisher, a standard Intamin Mega-Lite. We were among the first in line and rode the first train of the day. Fortunately we were allowed to chose our preferred seat (front row of last car); people trying to wait another cycle for the front row were forced to fill the train. 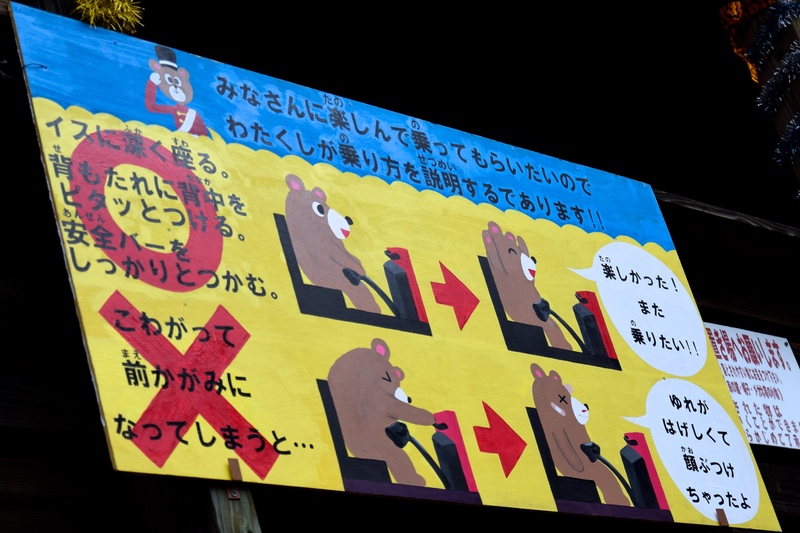 I don’t know if it’s Japan’s militant work culture or just a keen desire to be orderly at all costs, but assigned seating on coasters here is pretty much non-negotiable. 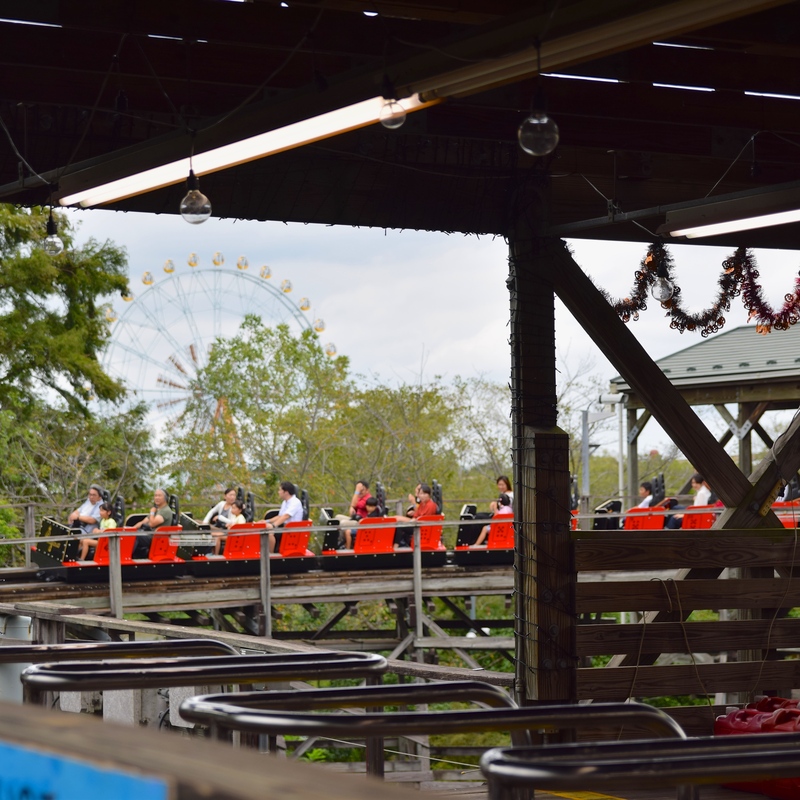 Winding up in the front row of a coaster was a real gift (though in this case, the short train of Mega-Lites don’t make for pronounced differences between front and back rides). 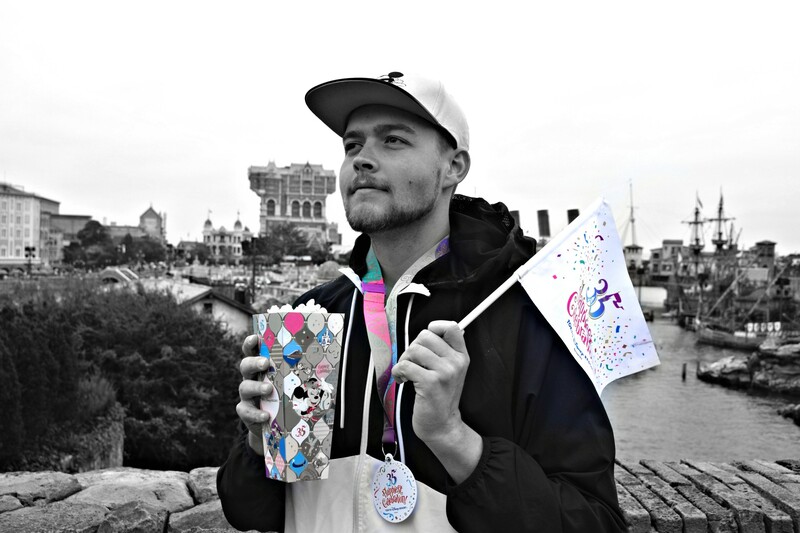 While charming, I find Mega-Lites overrated. 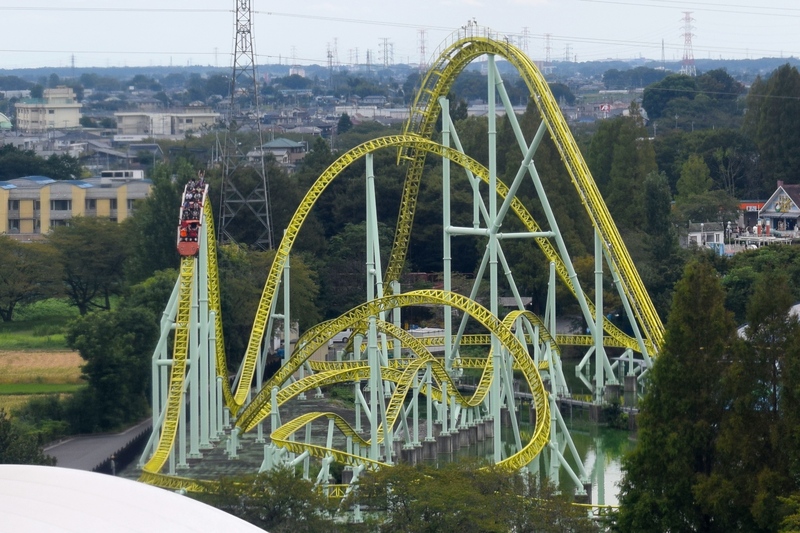 I can recall Kawasemi debuting at #7 in on the Mitch Hawker Internet Steel Coaster Poll at one point – did it feel like we were riding the 7th best steel coaster on earth? 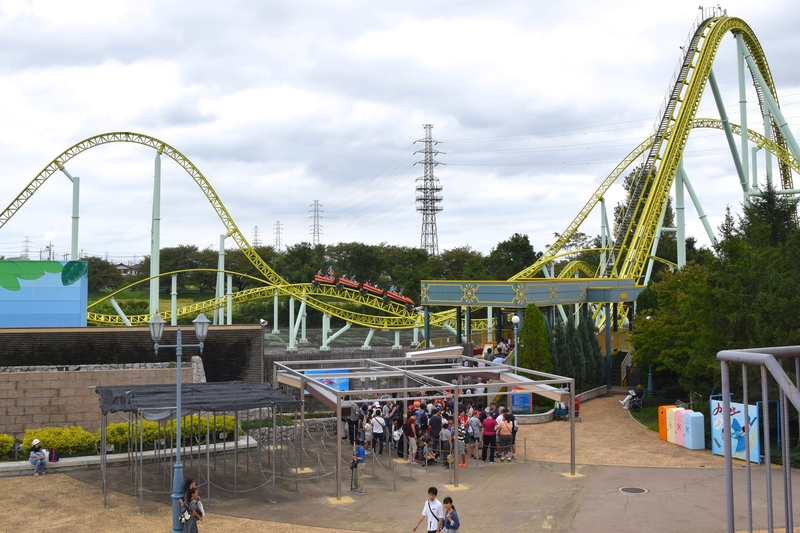 Frankly, I don’t think it’s even the 7th best steel coaster in Japan. That’s right, Ron! 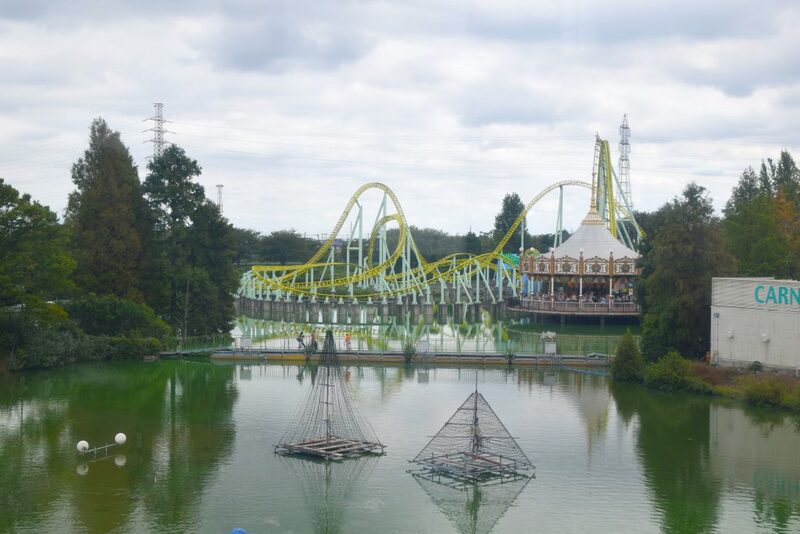 There are TWO Intamin coasters here! Picking a favorite will be hard. Regina is a real oddball, but she’s beautiful and strong. 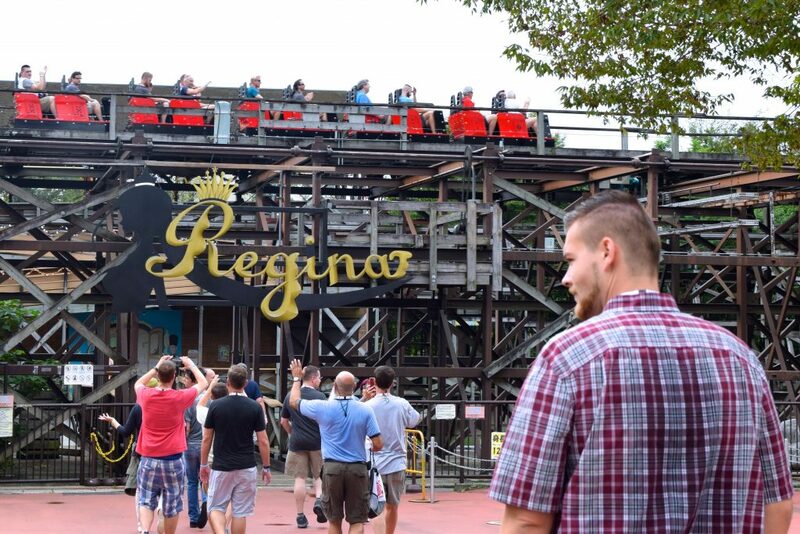 Regina (which means “queen”) implies that this giant Intamin woodie is “The Queen of Coasters”. 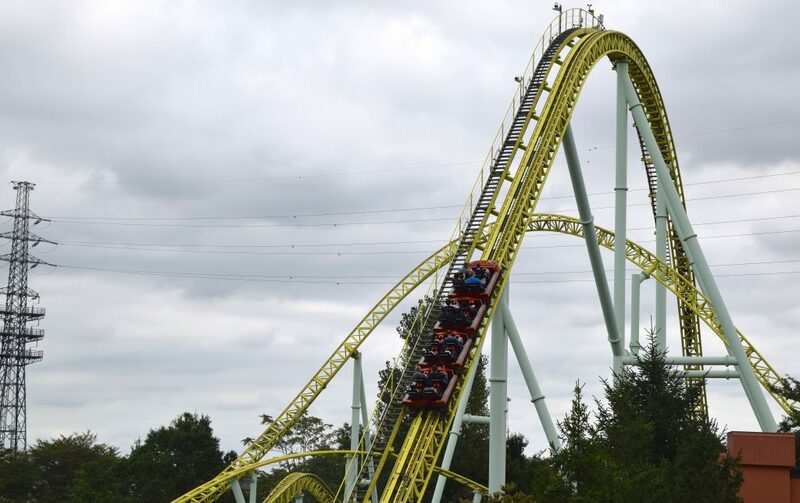 Does Rita: Queen of Speed at Alton Towers know about her? Are they friends, I wonder? Either way, Regina is the strong, boisterous female role model that the world needs. What I’m imagining is a cross between Sailor Moon and Wonder Woman. Do you see it? I think these people see it. Regina is a rare example of a well-functioning oversized woodie. It’s what the Dinn-Summers mega woodies of 30-odd years ago wanted to be. Our satisfactory ride warranted a bag of “Bear Cakes”, which are pancakes made in the 3-dimensional likeness of a small teddy bear. So Japan. This Cake Bear was born without ears. Was delicious regardless. A standard Tivoli rounds out Tobu Zoo’s standard coaster collection (there’s a powered coaster around here too, somewhere). 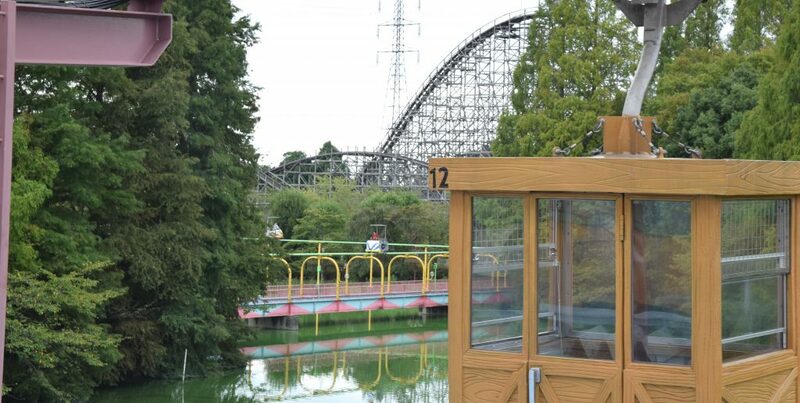 Teeny tiny train rides are very popular in Japan. 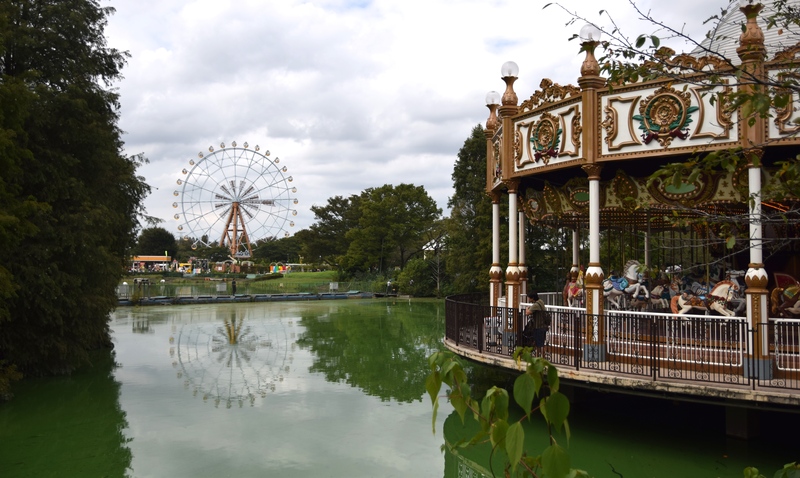 Considering what a mundane occurrence train-riding is for the bulk of Japan’s population, I’m surprised to report an utter fascination with them per most parks we visited. 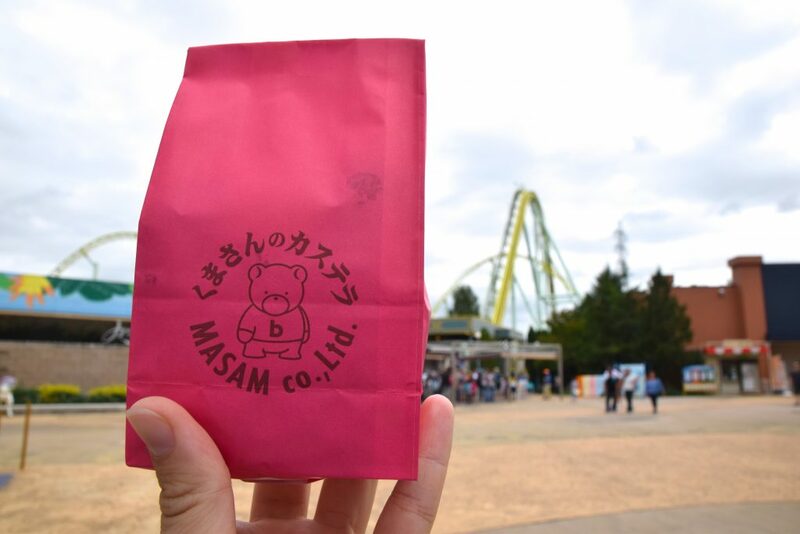 Japanese style French Fries (mashed potato extruded into strands and fried) is a local staple. We love their light texture, although some accuse the fries of being under cooked. 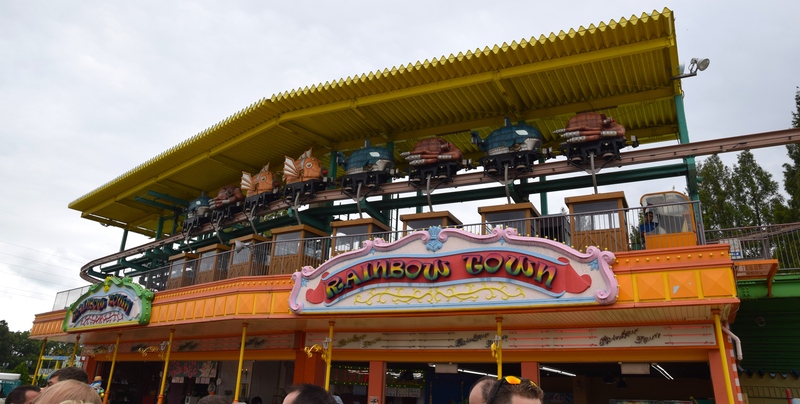 The powered coaster is located all the way over in “Rainbow Town”. Fortunately there is a transportation system in place. Sean is looking up the traffic report before we embark. 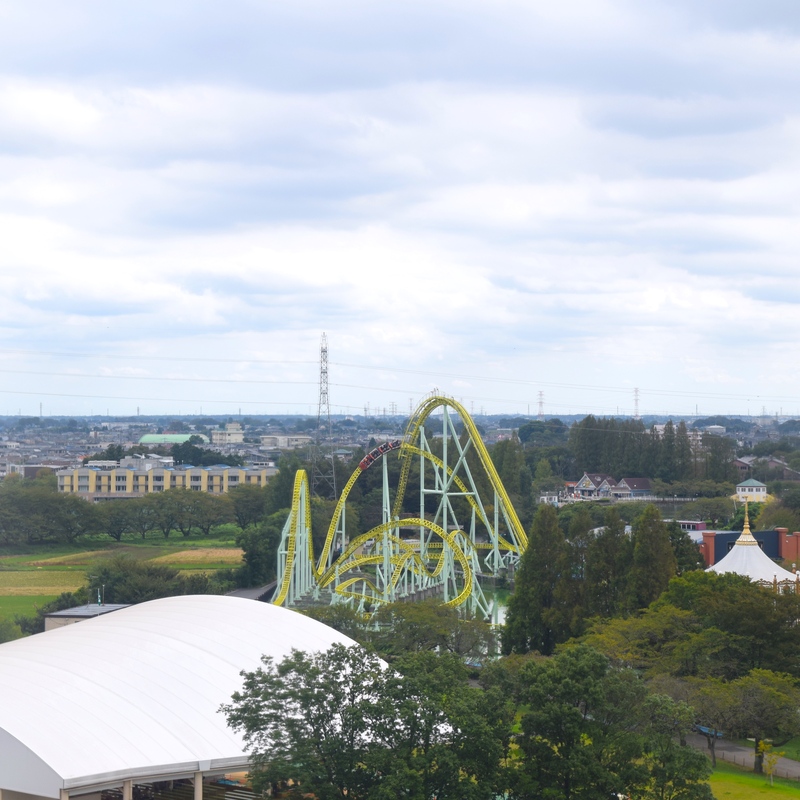 Monorails and peoplemover-type rides of all shapes and sizes are in abundance at Japanese parks. 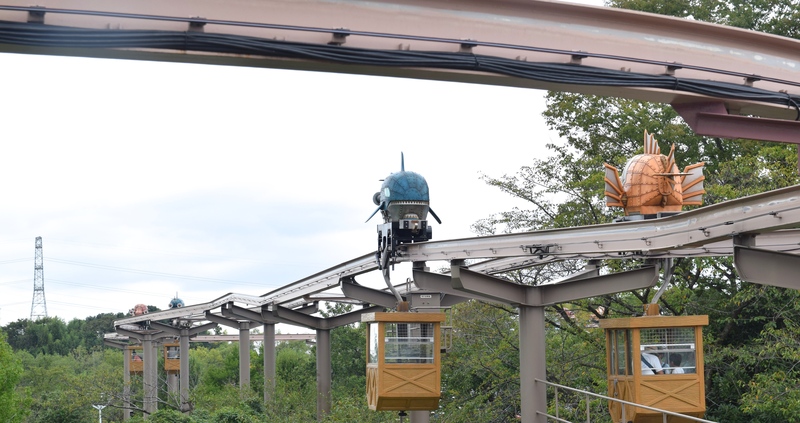 I must admit there is something delightful about jazzing up something as straightforward as transit from Point A to Point B.
Commuters on the suspended monorail consist of small, steampunk orcas and fish carrying box loads of human guests. There’s a nice view of Kawasemi from the station. The queue doesn’t look very long, but only one train was running at the time. Fortunately, the 2nd train was added later (why the ride didn’t open with 2 trains for our scheduled ERT, we may never know). 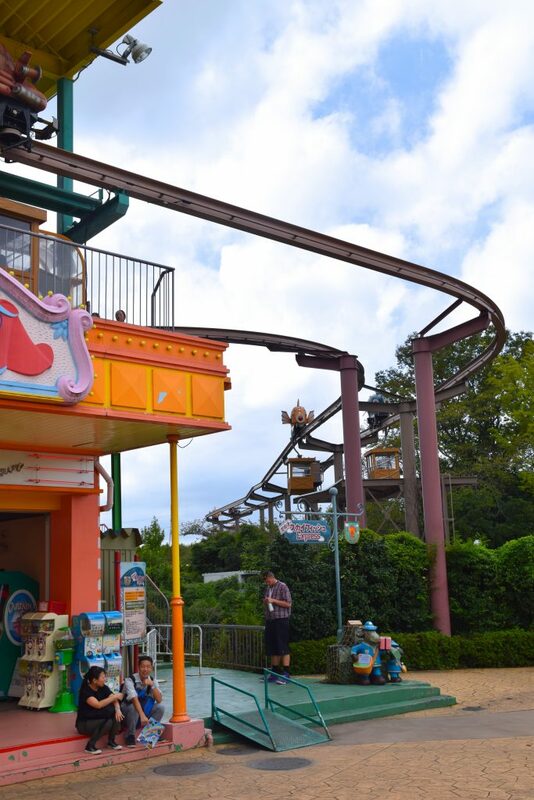 We never did get back to ride it a 2nd time. While the sluggishness of our ride could be attributed to being the first train of the day, we didn’t exactly feel compelled to wait in line for it (plus we didn’t know about the 2nd train until after we’d left). It’s a little cramped in there, but I have good company. 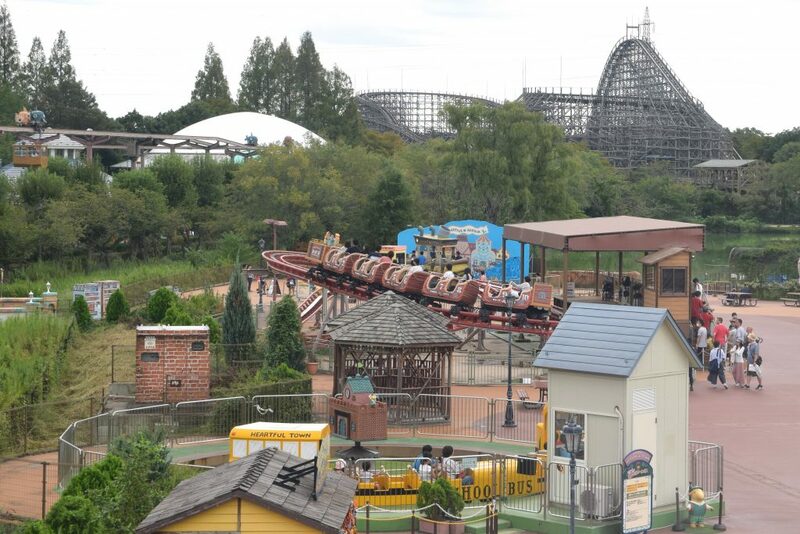 Here’s where Tobu Zoo’s amazing-looking Togo Looping Wild Mouse used to be. I wonder why it was demolished? Kawasemi certainly looks nice. It really is a good ride, too. 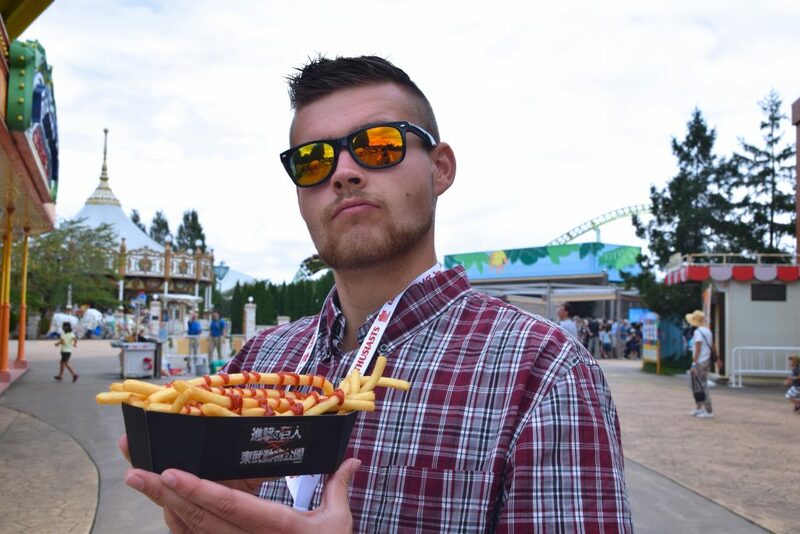 It’s not the hype surrounding it, but anyone would be lucky to have one at their home park. 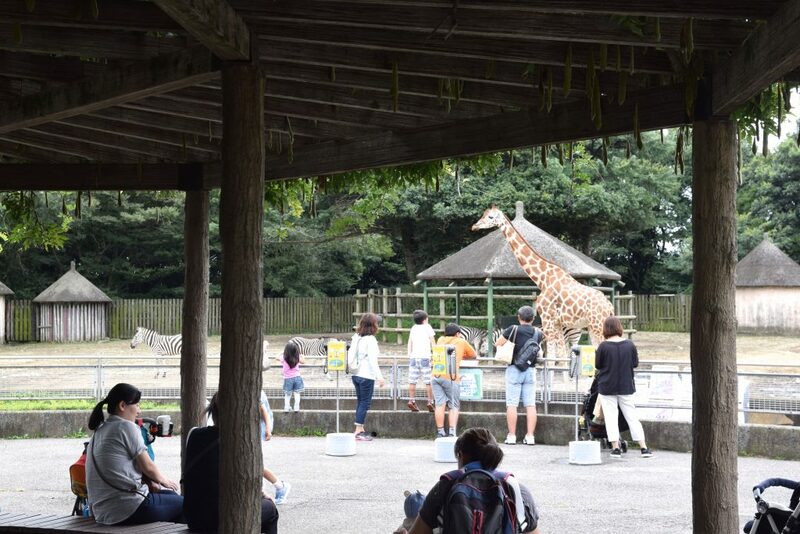 Tobu Zoo is quite large. Maybe too large per its the number of attractions. It’s a narrow, sprawling layout that doesn’t demonstrate a ton of foresight. There it is! That’s what we came all the way to Rainbow Town for! 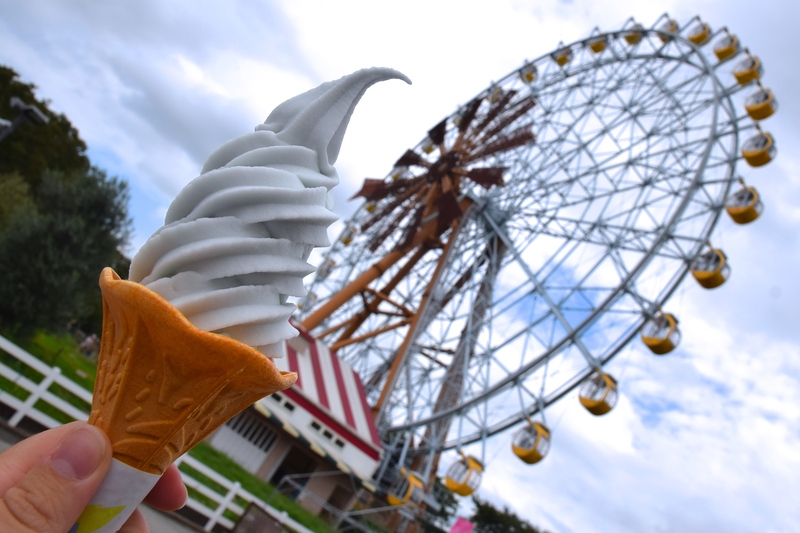 This was definitely going to be a Ferris Wheel-centric trip (Japan LOVES Ferris Wheels), so we figured a ride on Tobu Zoo’s dairy farming-themed wheel (!) was a good place to start. Kawasemi looks quite compact from this angle. 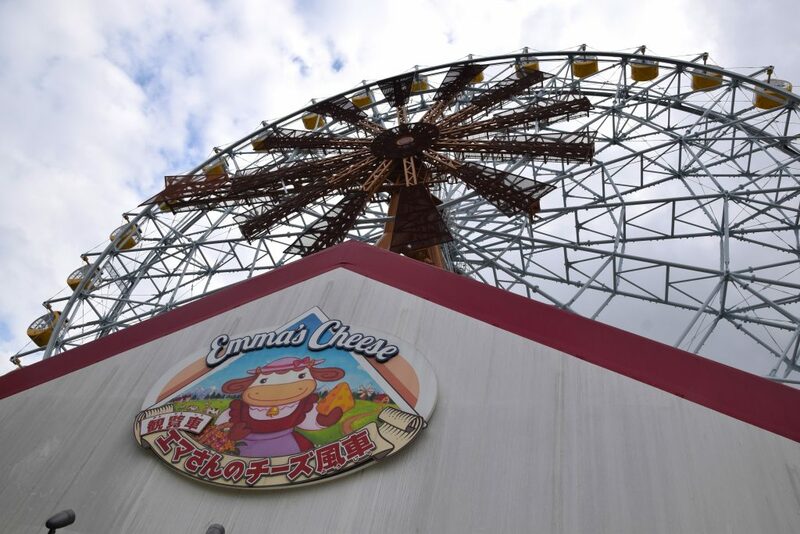 The coaster it replaced was a standard, Japanese-style “Jet Coaster”, with gentle drops and wide turns. Kawasemi may not be the most thrilling coaster ever, but it was certainly a major change from the prior coaster. 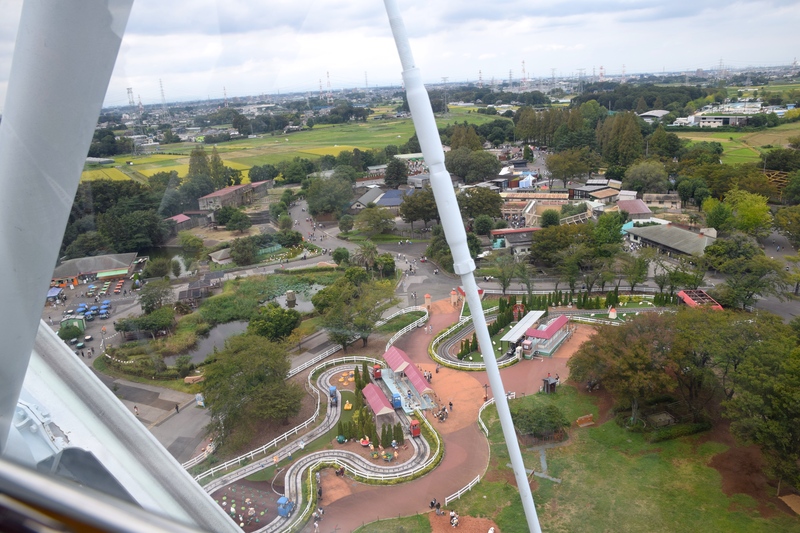 The Ferris Wheel is about half-way down Tobu’s lengthy plot. On one side of the wheel is mostly rides, the other, mostly animals. Tobu established a theme of regional parks in Japan looking nice from far away, but appearing rougher and “tired out” up close. This gives a better idea of Regina‘s awesome size than the photos from earlier. 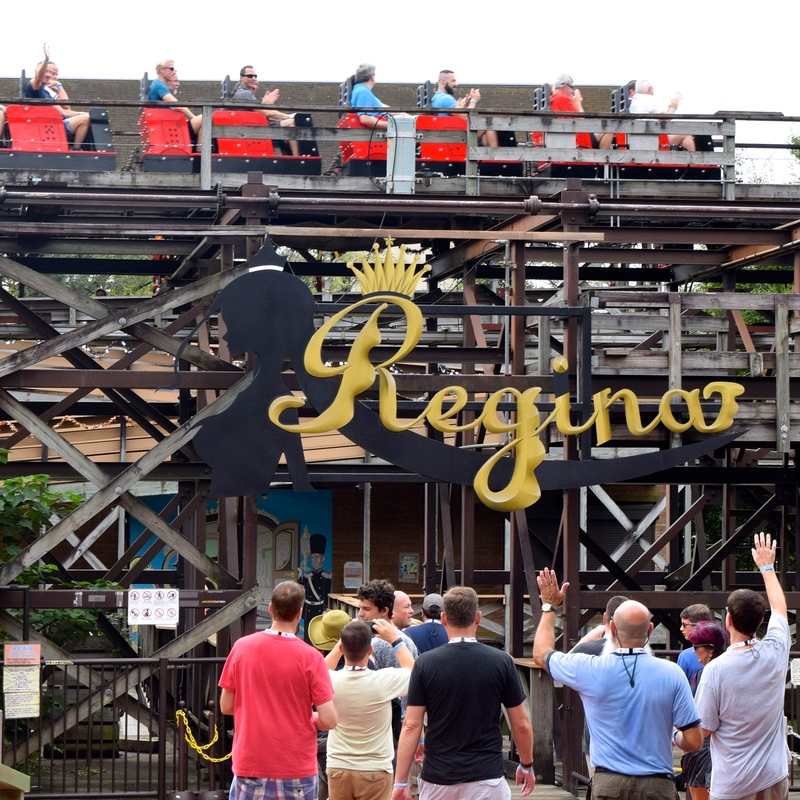 We did actually go back for a re-ride on Regina, and it was definitely worth the effort. Sorry, Kawasemi. Maybe next time. 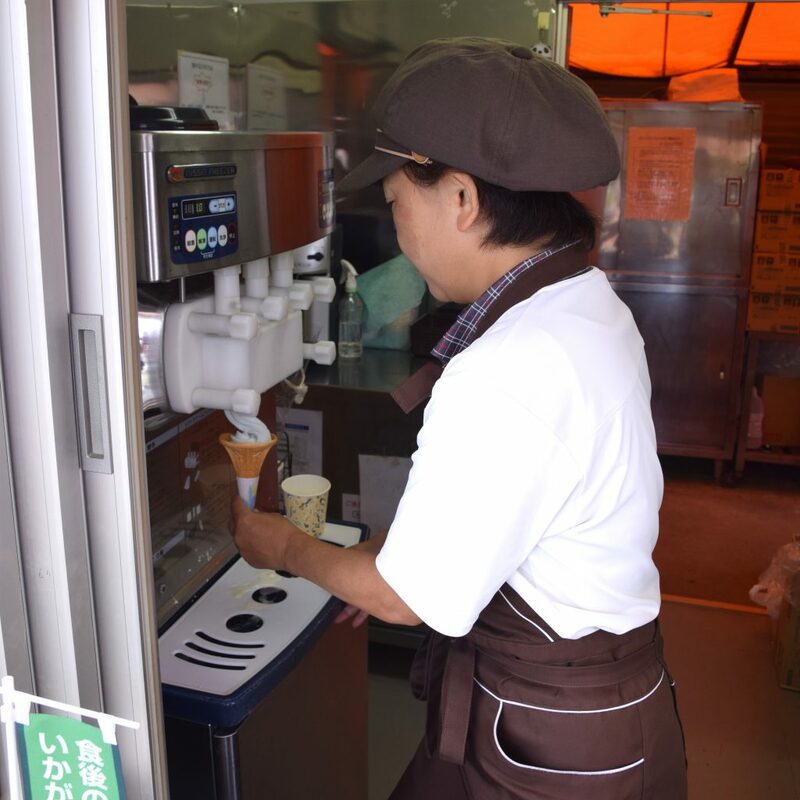 “Blue Soda” soft serve! Blue soda (or “cool soda”) is a very popular flavor in Japan, similar in style and flavor to blue raspberry. Look. This poor sad baby. 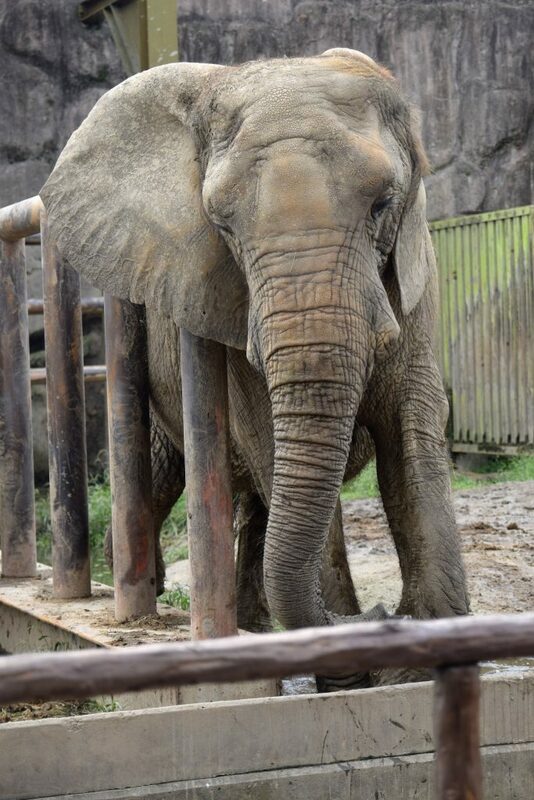 We wandered through about 1/3 of the zoo in hopes of finding animals that appeared well-cared for. Unfortunately what we kept finding was animals that looked dirty, underfed, and/or under-stimulated. And lots of concrete. Their beautiful elephants were caked in mud; their pools and fountains dried up. The general public merrily took selfies with these animals, ignorant to their obvious neglect. Alright. I’m sad now. Can we go back to Ocean Park? 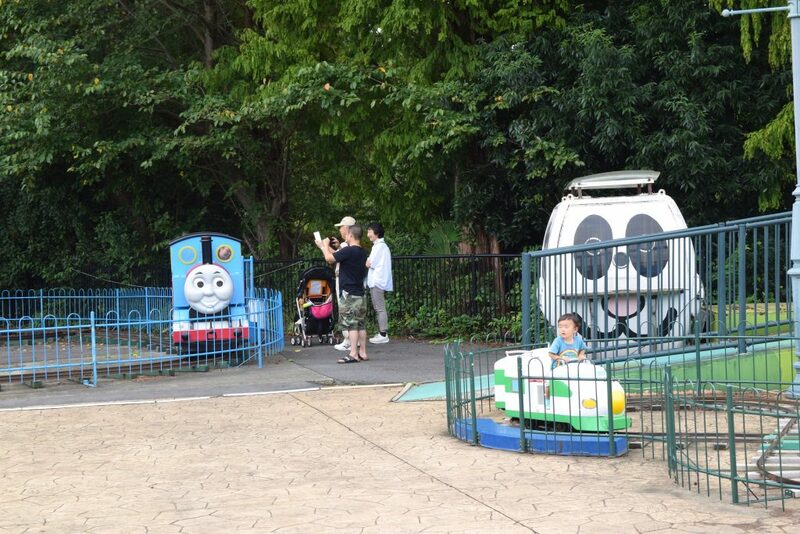 Disillusioned by the state of the animals, we drifted back into the ride side of the park. We kinda had to will ourselves to do that 2nd Regina ride; perhaps leave the park on a decent note. The only happy animals here? 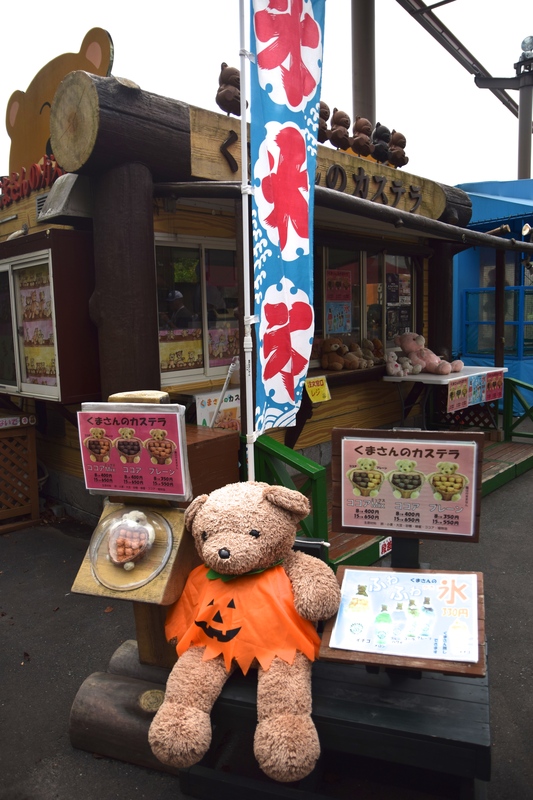 Cake Bears. Even the “Crash Test Bear” for Regina seems to have faired better than most. 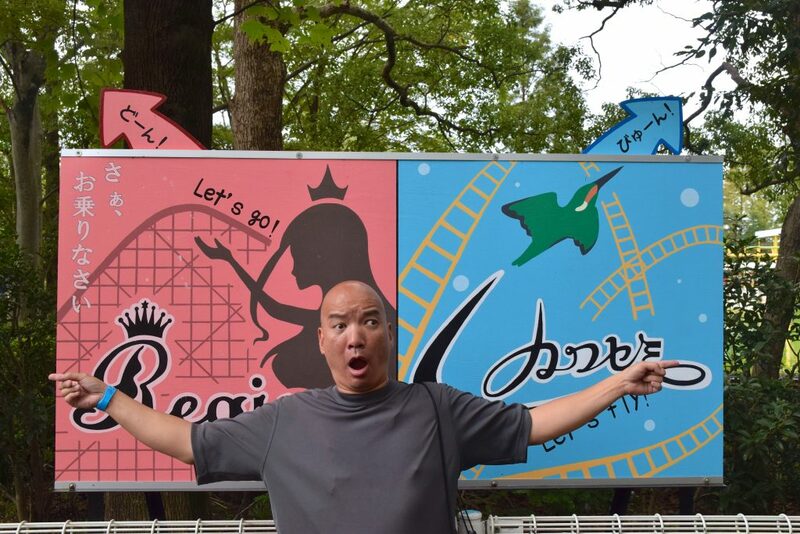 Based on the condition of Regina and Kawasemi, the park’s maintenance budget appears pretty high. You’d think they’d throw some of that over to the zoo side? Not a terrible start to the ACE tour, but not a great one either. At least the coasters were good. Moving on! 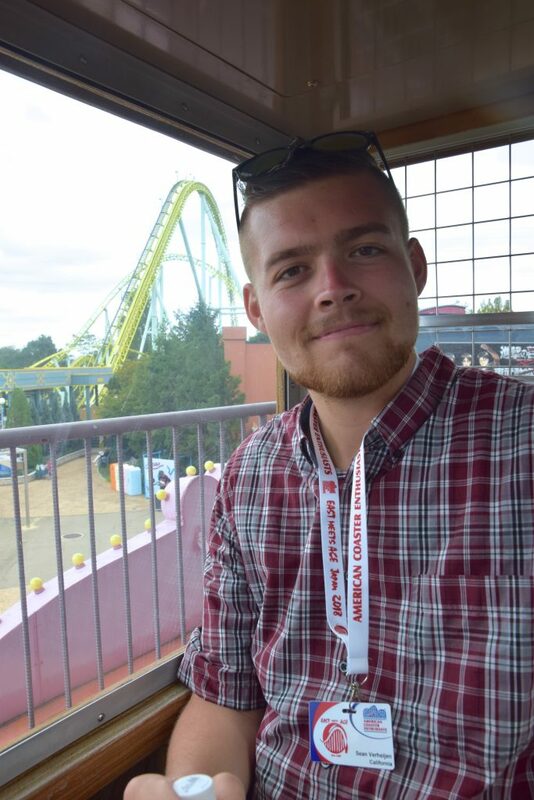 Previous PostPrevious Review: Horrorland Scream Park!